Lift & Accessibility Solutions is very pleased to offer the Extrema line of incline platform lifts to our clients. Sometimes there just is not enough room for a vertical lift in the home. 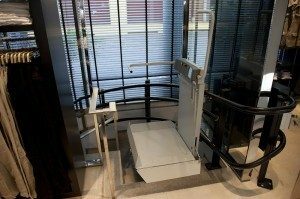 When the wheelchair needs to come upstairs with the user, this is when an Incline Platform Lift becomes the best solution. We are proud to bring the Italian made Extrema to America. We visited their plant in Italy and were impressed with the engineering that is part of these great lifts. They are compact, reliable and work on both straight and curved stairs. With the use of anodized aluminum rails, a special painted finish and airtight wiring, these lifts are suitable for indoor or outdoor applications. It has rechargeable batteries, making it available even during power outages. 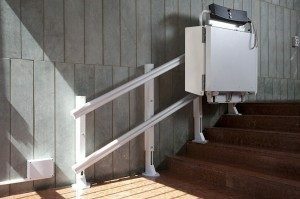 The Slim is designed for custom staircases and is the most compact incline platform lift on the market. Call us today to talk to our elevator contractor!